Our cornerstone seminar “Forecasting Severe Convection I” by Dr. Tomáš Púčik from 25 to 29 March 2019, which combines lectures with practical forecasting exercises. When this seminar was last held in October, it received a very high mean participant grade of 9.9 (on a scale from 0 to 10). Join and boost your ability in forecasting severe convection! Our specialized seminar “Aviation Forecasting of Severe Convection” by Dr. Tomáš Púčik from 8 to 12 April 2019. In the past years a growing demand for this forecasting course tailored to aviation forecasters, evolved. At this moment, there are only 3 places left for this course. For autumn 2019 there is another such seminar planned. Our high-level seminar “Dynamics and Prediction of Severe Convection” (Forecasting Severe Convection II) combines lectures from leading tornado and severe weather researcher Prof. Yvette Richardson from Penn State University in the USA, which practical forecasting exercises. This seminar is especially suited for advanced European forecasters, such as shift leaders, warning meteorologists, and to advanced students of meteorology and academic researchers with an interest in forecasting. The full ESSL activities calendar for 2019 can be found here. In our recent blog post about very large hail events of 2018, we mentioned that hail produces large damage. However, it is rarely deadly, in contrast to flash floods. Based on the data from the European Severe Weather Database, by 12 December, flash floods have killed 152 people across Europe, parts of northern Africa and the Middle-East. 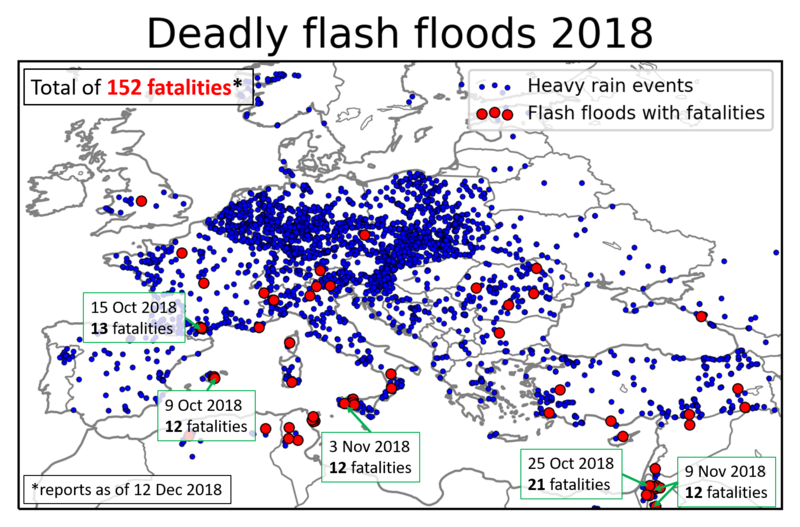 While most of the heavy rainfall events were reported in central Europe, the most deadly flash floods occurred in the Mediterranean area, including the 5 events with the highest number of fatalities, ranging from 12 to 21. Heavy rain and deadly flash flood reports across Europe in 2018. 5 events with the highest number of fatalities are indicated. Who was at most risk during the flash floods? Out of 35 events with more than 1 fatality we identified 16 that involved vehicles being swept away by the floods. Because not all reports include detailed description of the fatality circumstances, the ratio of events including fatalities in cars is likely even higher. The deadliest flash flood also involved a vehicle. In a tragic event on 25 October, a flash flood swept away a bus in Jordan, killing 21 persons onboard. Besides vehicles, several events involved a group of hikers being swept away by flash floods in the narrow canyons. The first such event occurred in Israel, on 5 May and resulted in 10 fatalities. On 1 August, 5 hikers were killed on Corsica and 10 hikers drowned in the Pollino national park in Italy on 20 August. This shows that data from the ESWD can be used not only to identify the areas with the highest severe weather incidence, but also to compare the impacts of severe weather phenomena or to find out which groups of people are at most risk in a given severe weather type. Based on feedback from ESWD users collected at meetings in November 2017 and the ESWD User Forum in March 2018, the European Severe Weather Database has been updated to Version 4.4. 1. Kyrgyzstan, Tajikistan, Turkmenistan and Uzbekistan were added, so it is possible to enter reports for these countries. ESSL aims to learn more about storms in Central Asia! 2. 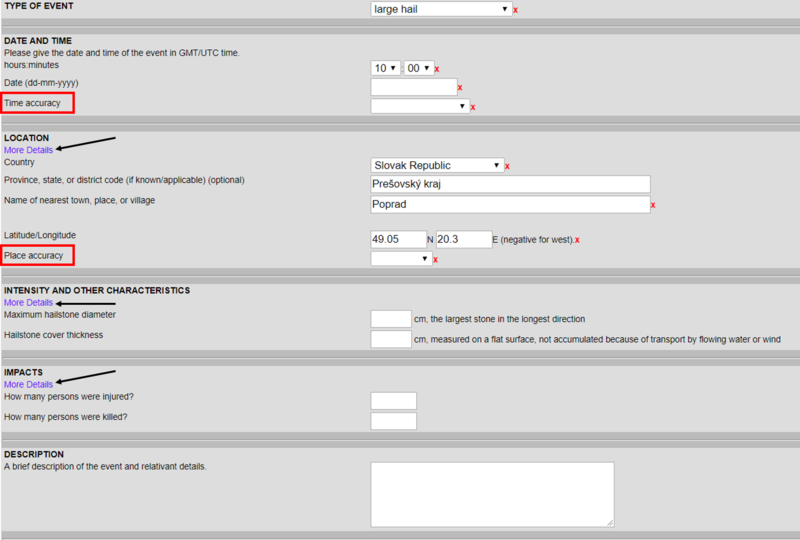 The submission form has been simplified substantially. 3. Place and time accuracy have become required fields. 4. Funnel clouds can not be submitted into ESWD anymore. 5. The country can now be changed in the submission form. 6. Impacts of the event can now be indicated by ticking checkboxes. Each type of severe weather has a different set of impacts that can be selected. 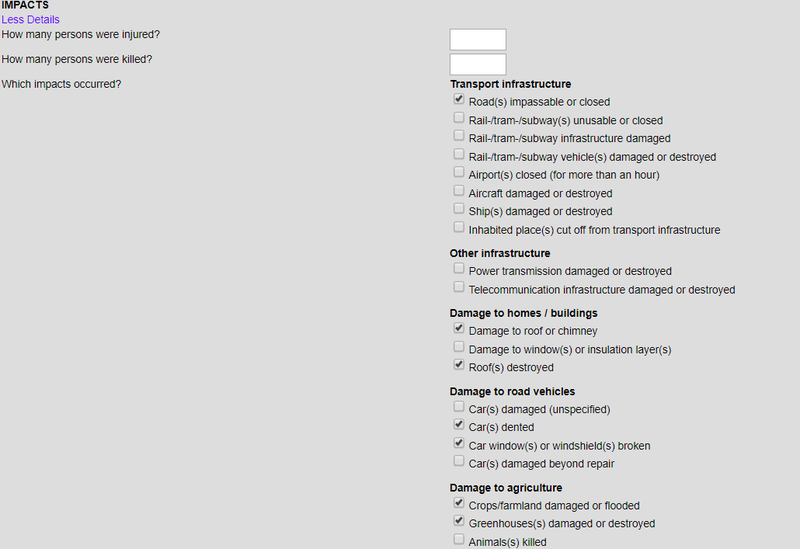 This step streamlines the reporting of impacts into the ESWD, and makes it easier to compile statistics of severe weather impacts of the storms across Europe. An example of impact choices for large hail event type. You can try out the new version by accessign the ESWD website. We welcome your feedback at eswd@essl.org!